When the farmer sells soybeans to a grain dealer, the beans may then go to a number of ultimate destinations. When processed, a 60-pound bushel will yield about 11 pounds of crude soybean oil and 47 pounds of soybean meal. 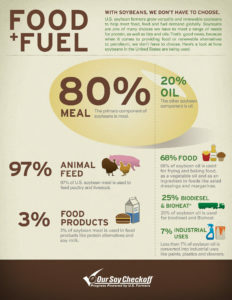 Soybeans are about 18% oil and 38% protein. Because soybeans are high in protein, they are a major ingredient in livestock feed. 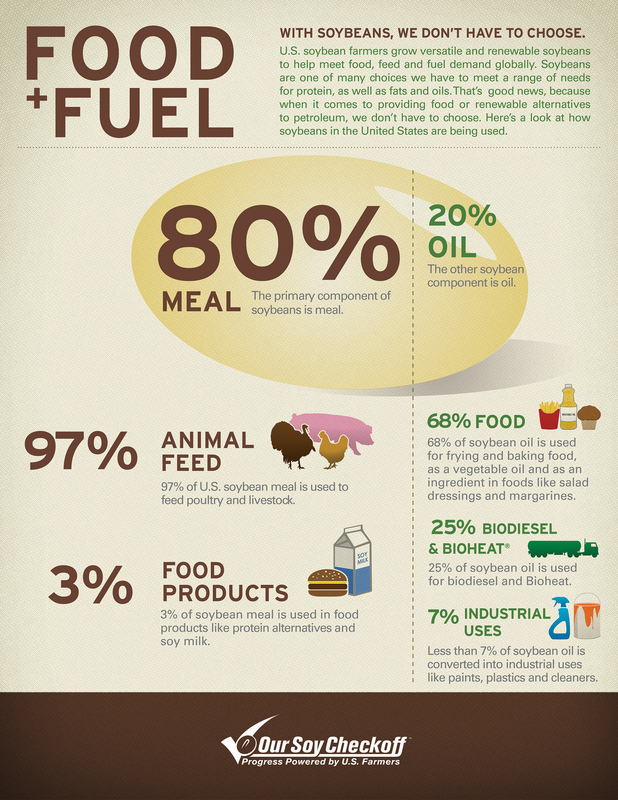 Soybeans are processed for their oil (see uses below) and meal (for the animal feed industry). A smaller percentage is processed for human consumption and made into products including soy milk, soy flour, soy protein, tofu and many retail food products. Soybeans are also used in many non-food (industrial) products. Nearly all soybeans are processed for their oil. Soy processors (such as Cargill & ADM) take the raw soybeans and separate the oil from the meal. The oil may be refined for cooking and other edible uses, or sold for biodiesel production or industrial uses. The processors bake the high-protein fiber that is left after the oil is removed and sell it for animal feed. 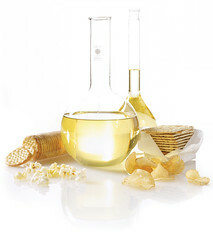 Soybean oil is used in cooking and frying foods. Margarine is a product made from soybean oil. Salad dressings and mayonnaises are made with soybean oil. Some foods are packed in soybean oil (tuna, sardines, etc.) Baked breads, crackers, cakes, cookies and pies usually have soybean oil in them. The high-protein fiber (that which remains after processing has removed the oil) is toasted and prepared into animal feed for poultry, pork, cattle, other farm animals and pets. 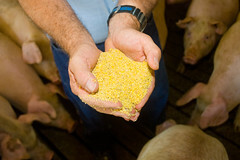 The poultry and swine industries are major consumers of soybean meal. Over half of the soybeans processed for livestock feed are fed to poultry, about one-quarter is fed to swine, and the rest is used for beef cattle, dairy cattle and pet food. Soy protein is increasingly found in fish food, both for home aquariums and for the fish grown for eating. Most marine species were fed fish meal at one time, but the scarcity and increasing cost of fish meal has led producers to switch to high protein soymeal for a variety of marine species. Around the world, soy protein may be found in feed for most animals. Biodiesel — biodiesel fuel for diesel engines can be produced from soybean oil by a simple process called transesterification. This process removes the glycerine from the oil, leaving soy biodiesel. 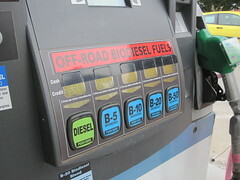 Soy biodiesel is cleaner burning than petroleum-based diesel oil. Its use reduces particulate emissions, and it is non-toxic, renewable and environmentally friendly. Biocomposites are building materials made from recycled newspaper and soybeans. They replace other products traditionally made from wood, such as furniture, flooring, and countertops. Particleboard, laminated plywood and finger-jointed lumber are made with soy-based wood adhesives. Soy products are also found in many popular brands of home and commercial carpet, and in auto upholstery applications. Soy oil produces an environmentally friendly solvent that safely and rapidly removes oil from creeks, streams and shorelines without harming people, animals and the environment. Soy is an ingredient in many industrial lubricants, solvents, cleaners and paints. Candles made with soybean oil burn longer but with less smoke and soot. SoyInk is superior to petroleum-based inks because soy ink is not toxic, renewable and environmentally friendly, and it cleans up easily. Soy crayons made by the Dixon Ticonderoga Company replace the petroleum used in regular crayons with soy oil making them non-toxic and safer for children. Soy-based lubricants are as good as petroleum-based lubricants, but can withstand higher heat. More importantly, they are non-toxic, renewable and environmentally friendly. Soy-based hydraulic fluid and rail flange lubricants are among the more recent products developed with check-off funds. Soy based foams are currently being developed for use in coolers, refrigerators, automotive interiors and even footwear. Beginning in 2007, Ford Mustangs and other vehicles rolled off the production line with soy foam in the seats. 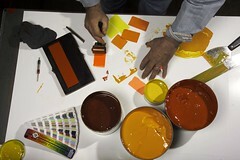 New uses in the automotive and equipment industry followed, including lubricants, body parts, interiors and seating.